I'm going to share something that I know is probably making its rounds on the Mercy Ships blogosphere already, but I just can't help it. Truth be told, for all the talk of Perrin and his antics, for all the excitement over mamas who know my name and babies I get to cuddle, it's still been a rough few weeks. And we need all the encouragement we can get. You see, we have another little boy getting ready to go back to Jesus on the wards right now. He's one of the Burkitt's kids, and his name, Aime, means love. I can't think of a better word to describe him. He's Yovophobic, it's true, but the tumors that swell his cheeks make him one of the most kissable kids around. He's due for his third round of chemotherapy now, but his body is failing, trying to fight off a nasty respiratory infection that will most likely claim his small life. The day the Big White Whale landed on the black shores of Africa was a blessed day to the Sons of Men. It came with Angels to walk amongst the Sons of Men. Why do I call them Angels? Let me tell you of my time with them. maidens and ladies, though flesh as us, yet with hearts as Angels. bringing from above the Father's love to the Sons of Men. they fix with tools untold. Like messengers of the Most High they came. to shores of Men afflicted and in pain. as Angels walking amongst the Sons of Men. yet these Angels are born to preserve humanity. yet with speed they move to save. they endlessly toil to make right the wrong. and yet as Angels you served the earth. Gold is digged from earth beneath. Treasures are hunted on high seas. can only in hearts like yours be found. Your labor in the Lord shall not be in vain. The Lord of Life and Light will light your path and guide your life. For you are truly Angels amongst the Sons of Men. I'm not going to type out the poem he wrote for Aime today, because I'd just end up crying again. Maybe later I'll share it with you, once I know how this battle is going to end. For now, I'm going to shut my eyes to the darkness and see only the light. I'm going to see Maomai, her cheeks round and full, her mama smiling and proud, telling me that they're finished here, that Maomai doesn't have to come back anymore because she's well now. I'm going to see Benjamin, my little boy in A Ward who has no front teeth and a bandaged leg and who absolutely shrieks with laughter when I speak Fon to him. And the Lord of Life and Light will light my path and guide my life. It's been so long since you saw him but I hope, in the dark, you will think of Matthew too. He is our increasingly chubby, lovely, giggly little boy; and next week (when his cochlear implant is turned on) he will hear for the first time. He will finally hear the word 'love' - something he's been showered in since he began his journey home. A journey that included you. Thank you for getting him and my Mom one step closer to us one year ago. He brings an abundance of light to our lives - we can afford to share. Wow. I have been a reader of yours for awhile now and I am always inspired by you and the healing you are bringing to those precious children. This is the first time I have felt the NEED to commet. Praise the Lord for Prince and his beautiful poem. It touched my heart and when you need a pick-me-up after a hard day this is truly what you should read because you are and Angel among men. Praise God for you and the work you do! Beautiful and too moving for words. Thank you for sharing this poem with your readers. Prince Eddie is a treasure found in a most unlikely place. I started reading your blog last year when you were on the other ship and it quickly became one of my favorites. Your writing is genuine and heartfelt and unpretentious, and you have a gift for telling your story (and your patients' stories) that can move me to tears. I really admire you and Mercy Ships for the work you are doing to improve the lives of these people who have no other resources. Your blog helps bring these people to life who otherwise would just be faceless statistics to most of us in the Western world. May I have your permission to copy this poem, giving the full name of the author as you have given, but also your name, and webpage, to some of our family? 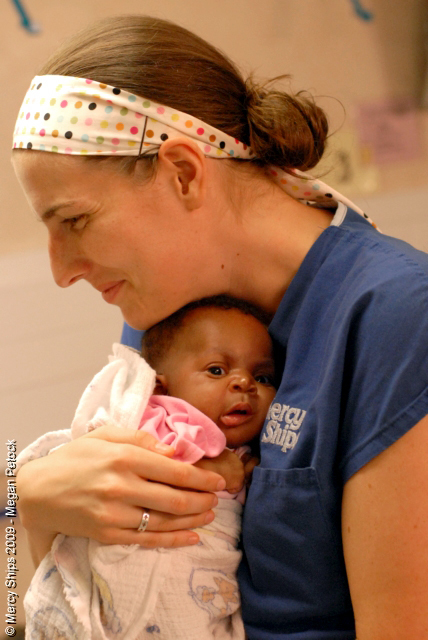 We are applying for Mercy Ships, and I wanted to include it in our first letter to our families, because it would be a great way to illustrate the miracles you are doing. You can reply to our email. Thank you Ali!